The sky-high sales of Apple’s iPad lineup have encouraged many manufacturers to jump into the tablet market with somewhat optimistic sales targets. Now, at least one analyst is claiming that these same manufacturers have all reduced their sales forecasts due to lower than predicted sales numbers. According to J.P. Morgan analyst Mark Moskowitz, total tablet production may decline by about 10 percent since early March estimates. Many manufacturers, such as Acer, Dell, and RIM, will allegedly be reducing tablet numbers by the hundreds of thousands. Moskowitz believes the reduction trend is due to an “increasing risk of a bubble burst” to the tablet market. 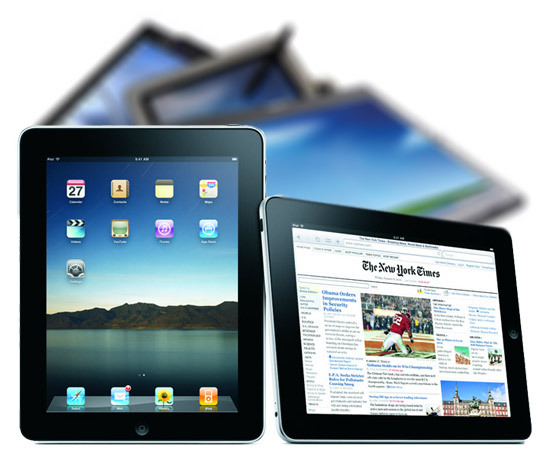 Manufacturers have exaggerated tablet sales numbers due to the highly successful iPad series. Big name tablet releases, such as the Motorola Xoom, RIM PlayBook, and Samsung Galaxy Tab, failed to gain significant traction in the market at their respective times of release. In fact, the Xoom, PlayBook and Galaxy Tab have had some mixed reviews since launch. These tablet makers are still playing catch-up to Apple, claims Moskowitz. 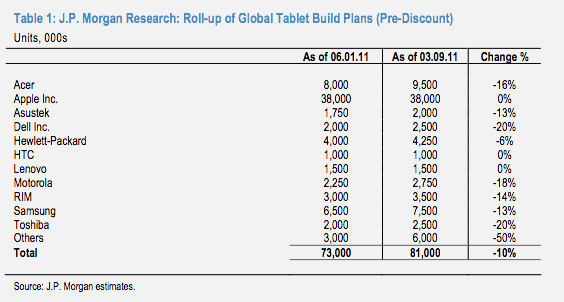 Still, Moskowitz expects tablets to make up a large part of total 2011 mobile shipment numbers. While smartphones will easily outnumber tablets, the analyst is predicting 21 percent of notebook PC shipments to be tablets. The sheer number of tablets will be big enough to have “spillover effects” on the broader mobile market, he argues. Tablets are still widely believed to be eating away at notebook sales. Meanwhile, Apple iPad 2 sales have been brisk since launch with an expected 6.75 million iPads shipping for the current quarter.